For a flexible range of phasing effects, from vintage to modern, the PH-3 pedal by Boss has it all. Featuring new Rise and Fall modes, you are greeted with a large scope of phasing at your fingertips. The pedal is easy to use with a simple interface, while it is also small and compact enough to fit nicely in your pedalboard. The PH-3 is kitted out with four main controls: Rate, Depth, Resonance, Stage (Rise, Fall and Step modes). Turn the Rate dial to control the speed of the modulation effect and you can go from a lamenting type sound right through to fast, warbling effects. Depth and Resonance control the depth and top part of modulation, but the really interesting effects come from the Stage dial. The Stage control features four separate stage phasers, 4, 8, 10 and 12, accompanied by Rise, Fall and Step modes. The new Rise and Fall modes are what really make this pedal stand out. The Rise and Fall controls provide unidirectional phasing, allowing your sound to continually rise or fall. The Step mode is a unique function that produces futuristic, computer-like effects. There is a jack where you can plug in an expression pedal if you wish, which enables you to control the rate, filter and tempo all in real time using your foot. You can also dial in a Tap Tempo using the stompbox to play at your own manually chosen rate. 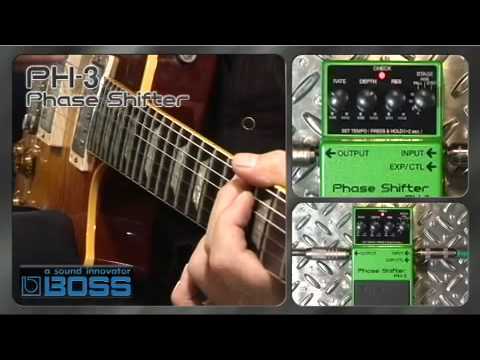 The Boss PH-3 Phase Shift is an impressive little pedal that gives you an abundant choice of unidirectional phasing effects.